NOW LETS MAKE A MATCH! When you compare your “Likes” list and your “Talents and Skills” list, you start to realize the kinds of awesome and amazing things that you can do. You then can take these realizations and match them with your PERSONALITY. This is the most effective approach on your CAREER journey. Take a look at this following Meter. It provides a very easy and quick assessment of personality types and traits that match up with the CAREERS available. It also helps YOU to evaluate your own personality and the kinds of characteristics you have. All through my life, I’ve heard and experienced personally a change in my job and even changes in my personality within these jobs. The slightest thing or person could set you off and develop this attitude regarding the job, or company or something. Something that would cause frustration, anger or plain dissatisfaction and that might be the reason why you quit. Too many miss out on opportunities simply because of misunderstanding and not knowing. 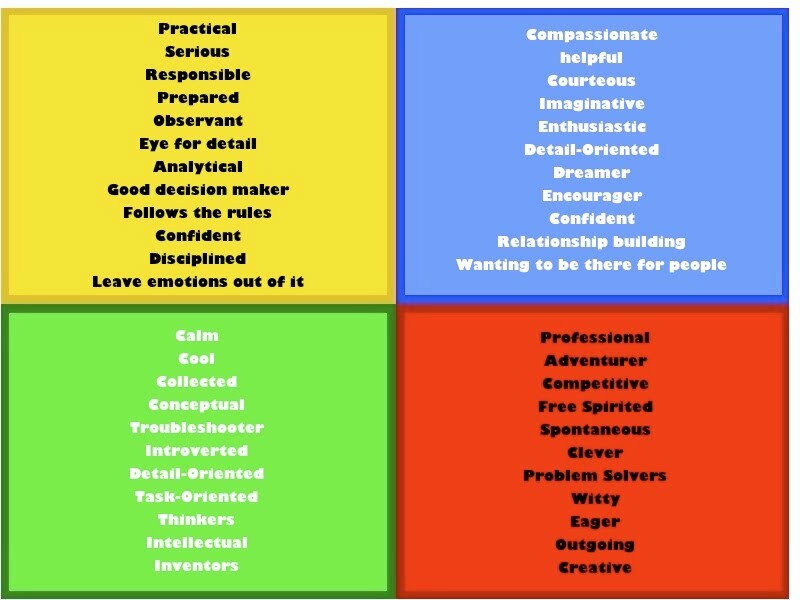 This personality meter will allow you to assess your own traits and characteristics. Then once you realize the kind of person you are, you can start to narrow your CAREER choices down to those that fit WHO you are. Not just WHAT you are. As you look through these lists, count up the number of traits that best fit you. Then find the color that has the highest number of traits. If you have a tie, don’t worry. That just means you are that much more marketable. No lie! You can adapt yourself to work in different environments or situations. 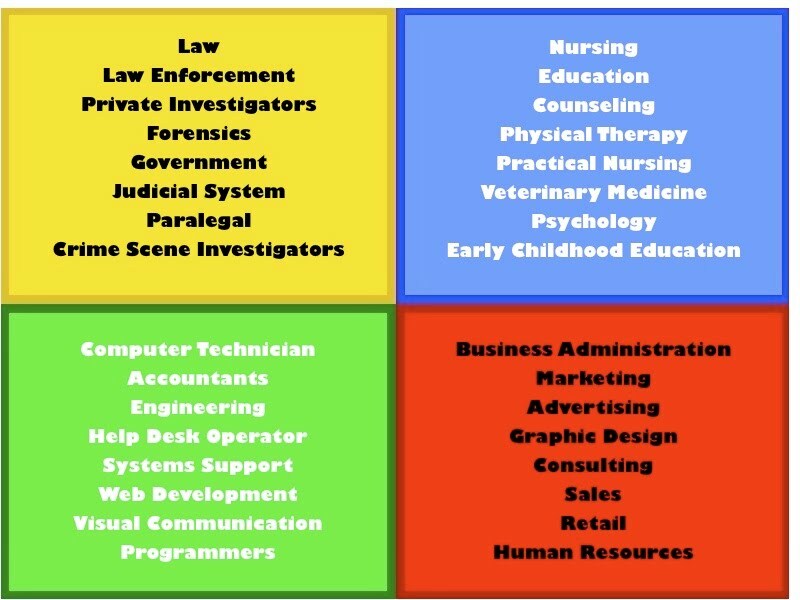 When choosing CAREERS, remember that you should choose to be in Business or Criminal Justice or Education, but not know exactly what you're going to do. Just know what areas you're interested in. Then as you learn more about the Business field, for instance, you will be able to find specific areas within Business that you could do! For specific information on a job or CAREER, the best site is www.bls.gov. This official Federal Government website provides the most up-to-date and accurate information regarding any CAREER or job that’s out there. Including future potential. Remember to choose 3-4 CAREERS before looking at COLLEGES.